Friday night saw the Stallions travel to Scarborough, ON to take on the Wexford Raiders in CPJHL action, and what a night it was for "The Herd" and standout forward Tim Holmstrom. "We really didn't have a good first period. The score (3-0) didn't indicate how well we played. We weren't playing our style of hockey, we just got a few bounces and capitalized on our chances" said Head Coach and Director of Hockey Operations Sylvain Cloutier. "We went over things during the intermission, nailed on some key points, and it really showed the rest of the game. We had the opportunity to give some of our younger games some exposure to the game, and I thought they were outstanding the rest of the way" Cloutier added. "Anytime you can give some of your younger guys some exposure to the game is a bonus. We're banged up right now, lots of our regulars out with either an injury or the flu bug that has been going through our dressing room. They stepped up, and played well. We need to play a full 60 minutes. We always have a lull in the first period. Guys doing to much individually. 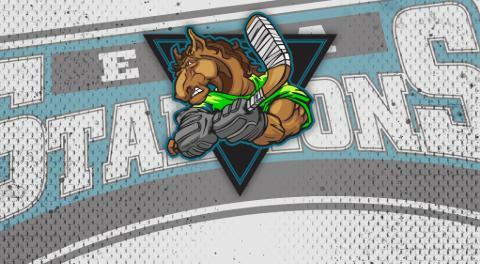 That's now what we teach, nor is it Stallions hockey. We're only going to get better as we go once everyone buys in" said General Manager and Assistant Coach David Lang. The Herd now turn attention to this weekends pack of games. The dreaded 3 games in 3 nights is upon us, all against tough opponents. Friday & Saturday involves a home & home series against division and league rival, The Grey Highlands Hawks. "They're a god opponent and match for us. They have a good squad, lots of talent upfront. We're going to be tested and we better come ready to play" Cloutier said. Sunday will see the herd hit the road for another trek, as they head to the province of Quebec again, as they take on the Maniwaki Mustangs for what I'm sure will be another heavy hitting affair. "We have 6 pts on the line here. Big 6 pts in the standings, against two good teams. Have to be prepared and execute what makes us successful. We do that, we'll have a good weekend" said Lang. SATURDAY NIGHT! 7:00 PM Warm ups, 7:30 PM Puck Drop at The Barn (Angus Rec Centre) vs Grey Highlands !